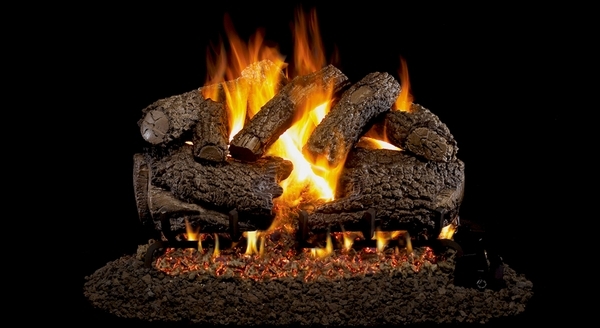 Gas logs designed to look like a real wood-burning fire are what Real Fyre Charred Forest Oak Gas Logs by Peterson are all about. The realistic, partially burnt exterior gives you the impression of a fire burning logs from a tree that fell in the forest. To add to the authenticity, the bottom log is 'burnt through' and allows you and your family to look inside the fire to see the flames and embers within. These gas logs not only look great, they are built to last thanks to the high-quality materials used in construction and the steel reinforcement rods. Peterson is the most trusted gas log manufacturer around for a reason. Take advantage of their skill and know-how, get a realistic look, and get the right value for your money with a set of Real Fyre Charred Forest Oak Gas Logs by Peterson. My compliments to the people who built this. Although I had a little bit of trouble with mounting it (had to make my own holes), I would recommend this product to anyone else looking for a gas log set.